The 2012 Innovation Award of the biotechnology regions in Germany was presented to Prof. Ulrich Schraermeyer in Frankfurt am Main. The Tübingen-based researcher received the award in recognition of his idea to use an active substance to treat the dry form of age-related macular degeneration (AMD). In order to bring the therapy into the clinic, Prof. Schraermeyer founded Katairo GmbH to enable him to patent and market his findings as quickly as possible. In Germany alone, around 4.5 million people suffer from the dry form of age-related macular degeneration, the most common cause of blindness in the industrialised world. Up to now, dry AMD has been considered untreatable. However, Prof. Ulrich Schraermeyer, head of the Experimental Vitreoretinal Surgery section at the University Eye Hospital Tübingen, has discovered that the oral administration of tetrahydropyridoethers (THPE) leads to a significant removal of lipofuscin (Fig.1) from RPE cells (1). In addition, further in vitro experiments revealed that human RPE cells also released their lipofuscin after drug treatment. The gradual accumulation of lipofuscin and drusen in the retinal pigment epithelium (RPE) during a lifetime is a feature of both wet and dry AMD, but especially the dry form. The resulting degeneration or geographic atrophy (GA) of the retinal cells leads to a gradual loss of vision. Thus it would seem logical that the removal of lipofuscin from the RPE cells might restore their normal physiological function and hence stop the progression of the GA. But until now, there has been no drug known to remove existing lipofuscin efficiently from the RPE or other cells in the body. Fig. 1 (a) Fluorescence light micrograph of the retinal pigment epithlelium (RPE) of an untreated monkey (excitation wavelength 360 nm). Lipofuscin granules (arrow) detected by the emission of gold-yellow light at 540 nm wavelength are regularly distributed throughout the RPE cells. Fig. 1 (b) Fluorescence light micrograph of the RPE of a treated monkey. 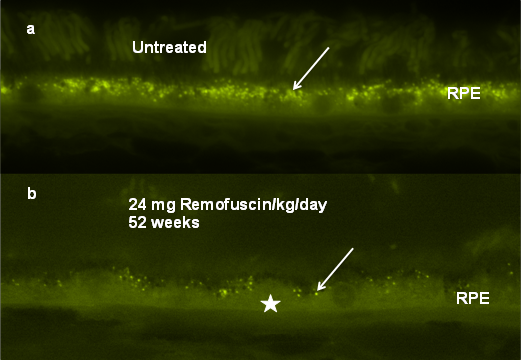 The RPE cells are partially free of lipofuscin granules (asterisk). Individual lipofuscin granules are indicated by an arrow. The dogma that lipofuscin can no longer be removed from aging cells can be disproved. Prof. Schraermeyer received the Innovation Award of the biotechnology regions in Germany in Frankfurt am Main. The award is in recognition of his idea, which has resulted in the discovery of a possible treatment for the causes of dry AMD. The panel of experts all agreed that this project from the STERN BioRegion is a prime example of excellent basic research coupled with economic feasibility.